Every bride to be thinks their engagement ring is the most beautiful ring ever – after all, it’s been chosen specifically to suit their tastes. However, when it comes to celebrity engagement rings, there are certain bands which have drawn an unusual amount of attention and admiration. Whether it’s down to their size, their price, or their quirky design, these rings have generated a serious number of column inches between them. 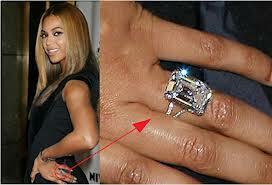 Beyoncé’s engagement ring is famous because of its price: her husband Jay-Z shelled out an impressive $5 million for the band, which showcases a huge 18 carat diamond set in expensive platinum. The ring, which was designed by jeweller Lorraine Schwartz, is thought to be one of the most expensive engagement rings in the world. Most people remember Victoria Beckham’s engagement ring because it was part of a set, as her husband David made the unusual decision to wear a band too! The former Spice Girl’s ring was set with a beautiful 3 carat marquise cut stone, whilst David’s was studded with a total of 96 diamonds. The truly unique set, made by Boodle and Dunthorne, is estimated to have cost around £200,000. It may not have been as expensive as Beyoncé’s, but singer Mariah was given an extravagant, one-of-a-kind ring of her own when fiancé Nick Cannon popped the question. The $2.5 million band boasted a 17 carat emerald cut diamond, surrounded by 58 particularly eye catching diamonds in her favourite colour – pink. If you’re looking for an engagement ring with all the wow factor of a celebrity band, look no further than Appleby! We have a stunning range of rings to suit all tastes and budgets – why not pay us a visit online or in-store?